Ceiling at the entrance to Medinet Habu temple, Luxor. Chamber paintings at Medinet Habu temple. Wall paintings at a chamber of Medinet Habu temple. Inner columns at Medinet Habu temple in Luxor. Wall relief with eagle at Medinet Habu. The main pylon of Medine Habu temple. Side view of Medinet Habu temple, Luxor. Painted columns inside the temple of Medinet Habu. Colourful decorations on the wall at Medinet Habu temple. Pharaohs colonnade inside the temple. Painting of the sacred bark on the wall of Medinrt Habu temple. 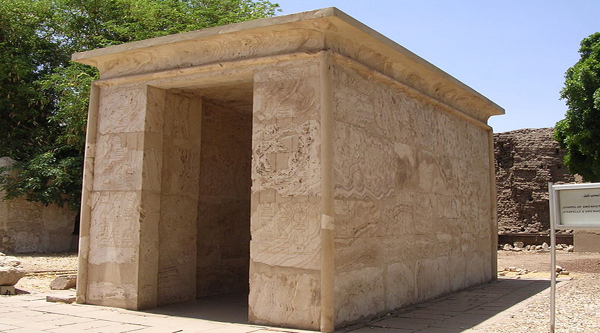 Solar boat wall relief at Medinet Habu temple. This is the name given to a large group of buildings that were started in the 18th Dynasty, but on which construction continued to Roman times. 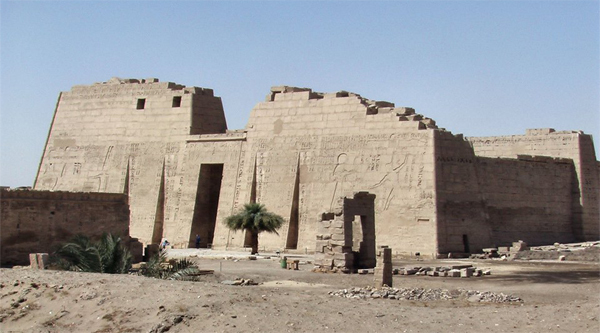 The main feature of the complex is the mortuary temple of Ramses III. It is approached by passing through an unusual entrance structure which he built. It is known as the Pavillion and undoubtedly was inspired by Syrian fortress. In front of it are two small watch-towers and a battlement of elevated stonework. 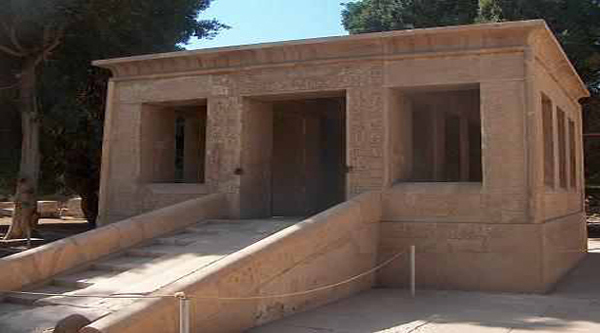 It has two upper storeys containing several small apartments with scenes of the pharaoh and his wives. The temple is built on the same plane like the Ramesseum, but is unique in having been constructed and decorated progressively, as the campaigns of Ramses III occurred that's why it provides a step-by-step record of Ramses III's military career, and has the added advantage of being extremely well preserved. This ancient site was associated with Amun in his form as a creator and fertility god, and was imagined to be the location of the primeval mound of creation. 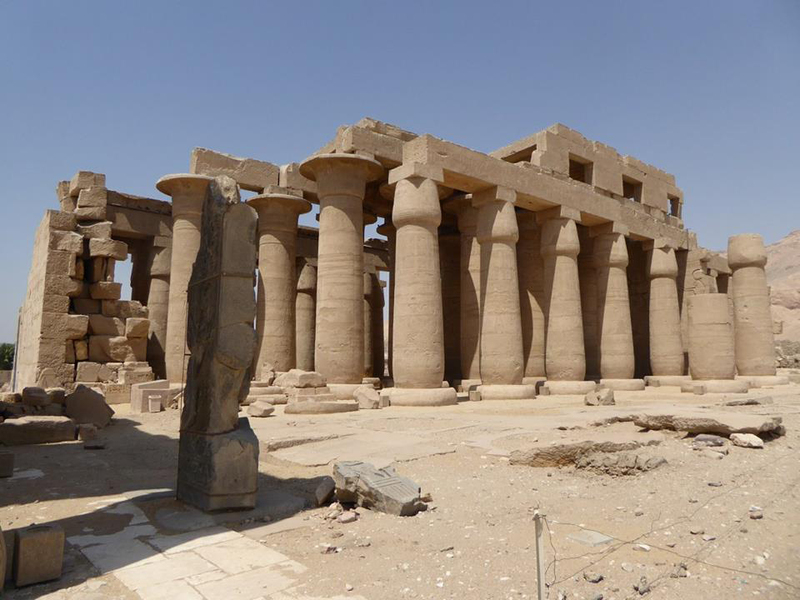 It lies directly across the Nile from Luxor Temple, and was the focus of several annual festivals. 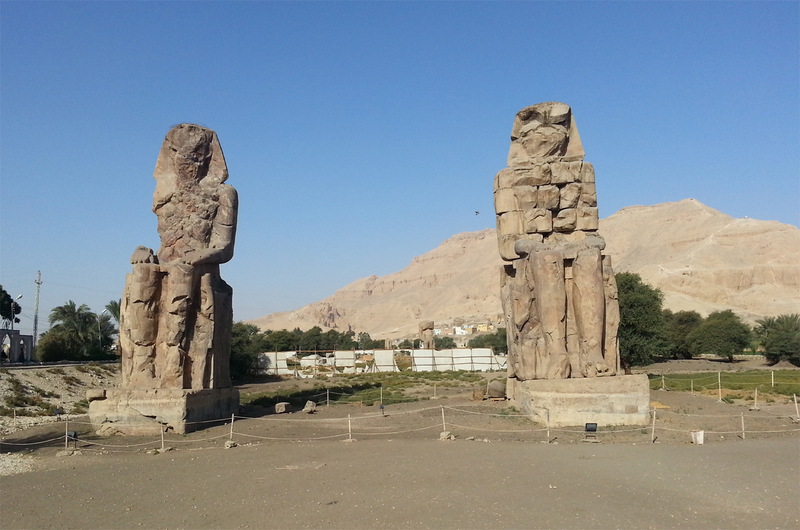 In the 18th Dynasty, a temple to Amun was built here by Hatshepsut and Thutmose III. 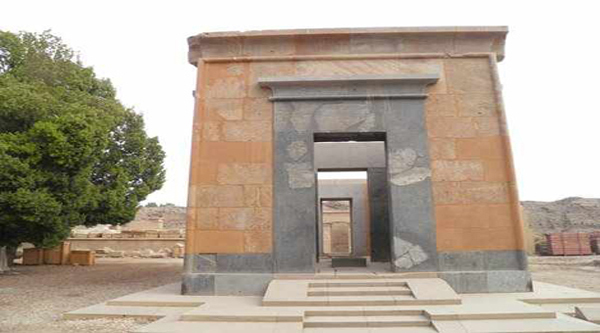 Ramesses III, the last great warrior pharaoh of the New Kingdom, chose this site as the location of his memorial temple, and enclosed the earlier Amun temple within his complex. The best-preserved of the New Kingdom memorial temples, Medinet Habu is decorated with scenes and texts illustrating the military victories of the king, as well as the rituals performed and festivals celebrated here. South of the temple, linked to the first court by a Window of Appearances, is a palace for the king. 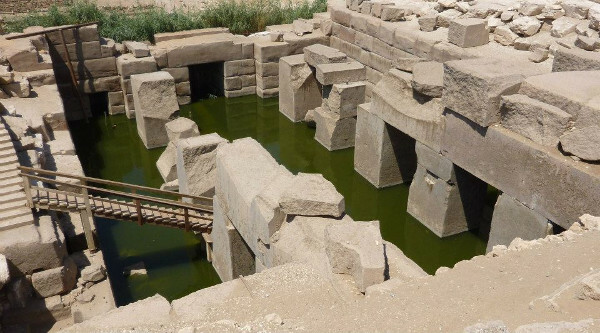 During the Late Period, several of the Divine Wives of Amun, the high priestesses and principal administrators of the Amun cult during this era, constructed their tombs in the forecourt of the temple. Passing through the entrance we cross a large court. 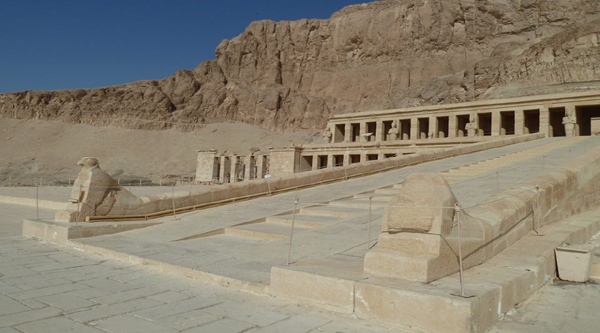 There are ruins of a temple built by Hatshepsut to the right, and a 25th dynasty shrine to the left. The 1st Pylon is covered on both sides with representations and inscriptions of Ramses III's military triumphs. On both towers there are grooves for flag-staffs, and the pharaoh is depicted in the traditional pose of dangling enemies by the hair while he smites them with his club. On the northern tower he wears the Red Crown and stands before Ra-Harakhte. On the southern tower he wears the White Crown and smites the captives before Amon-Ra. Both gods lead forward groups of captives. The captured lands are shown as circular forts inscribed with the names of the cities and surmounted by bound captives. At the foot of the pylons the scenes show Amon seated, with Ptah standing behind him, inscribing the pharaoh's name on a palm leaf; the pharaoh kneeling before amon and receiving the hieroglyph for "Jubilee of the Reign" suspended on a palm-branch, and Thoth writing the king's name on the leaves of the tree. The First Court had a colonnade with calyx capitals to the left and Osirid figures to the right; the latter were badly ruined by the early Christians. There is an interesting representation on the inner side of the 1st pylon. This is the Libyan campaign in which mercenaries took part. They are recognizable by the round helmets on their heads, ornamented with horns. The pharaoh in his chariot charges the enemy and overthrows them. The scenes on the side walls repeat the victorious war themes, and the triumphant return of the king with his captives to attend the great Feast of Amon. 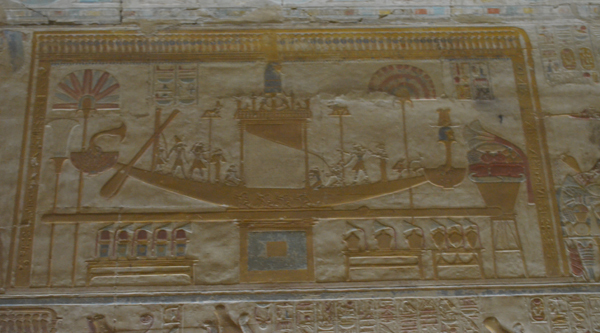 To the rear of the court Ramses leads three rows of prisoners to Amon and Mut. They wear caps adorned with feathers and aprons decorated with tassles. Also there is a long series of inscriptions recording Ramses? military triumph over the "Great League of Sea People". Passing through the second Pylon we find ourselves into the Second court which was later converted into a church. Due to covering the ?heathen? representations with clay, the reliefs have been preserved in good condition. On both sides of the court we find marvelous processional scenes. Those on the right represent the Great Festival of the God Min and those to the left - the Festival Ptah-Sokaris. There are also interesting war reliefs, which start at the inner wall of the second pylon. The 1st scene shows Ramses III attacking the Libyans with his charioteers. He shoots arrows with his bow and the infantry flee in all directions. The mercenaries are in the low row. The 2nd scene shows him returning from battle with three rows of fettered Libyans tied before him, and two fan bearers behind. The 3rd shows him leading his prisoners of war to Amon and Mut. The Great Hypostyle Hall of the temple was originally roofed and supported by 24 columns in four rows of six, with the double row of central column thicker than the others. The wall reliefs show Ramses in the presence of the various deities. Adjoining each side of the hall are a series of chambers. Those to the left were used to store valuable jewels, musical instruments, costly vessels and precious metals, including gold. There are two smaller Hypostyle halls each supported by eight columns, leading to a boat shrine. 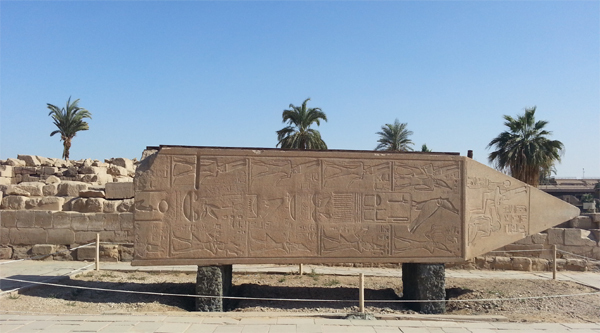 On the outside of the temple there are important historical reliefs that commemorate the wars of Ramses III. 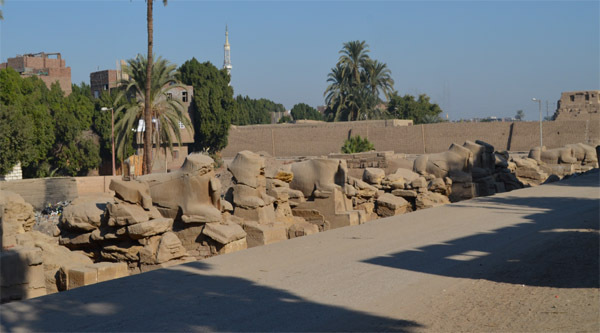 Those to the rear of the temple show the pharaoh?s battle against the Nubians. On the northern wall we find 10 scenes from the wars against the Libyans and the naval victory over the ?People of the Sea?. On the southern wall there is a Festival Calendar that includes a list of appointed sacrifices, as dating from accession of Ramses III to the throne.